5 tips to keep you busy—and your cookie consumption in check. Baking goes hand in hand with the holidays. Either you’re cranking out a batch of cookies or you’re surrounded by other people’s homemade goodies at work or at parties. It’s OK to have one or two, but eating the entire platter isn’t in anyone’s weight-control plan. 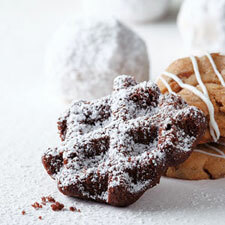 Here are 5 tips to keep you busy—and your cookie consumption in check. 1. Go for healthier snacks instead. Rather than reaching for a cookie, reach for a piece of ripe fruit or some fiber-rich veggies to fill you up. Get quick and healthy snack ideas. 2. Get outside and play! Start a snowball fight with your kids, build a snowman, go sledding or ice skating. An afternoon of “playtime” will brighten your mood and take your mind off those cookies—and burn calories to boot! See our holiday exercise escape plan. 3. Sign up for a holiday 5k with family. Walk or run to the finish line with your family and friends and help a charitable organization in the process. See 5 ways to walk more. 4. Learn a new craft. ‘Tis the season to pick up a new skill like knitting. Keep your hands busy and snack-free while working on a colorful scarf for a friend. Or make holiday cards. And if you are a die-hard holiday baker, bake away! Give away more cookies than you keep and experiment with some healthier recipes. 5. Spread some holiday cheer. Instead of shoveling cookies into your mouth, offer to shovel your neighbor’s driveway, start a neighborhood caroling tradition with the kids on your block or help prepare a holiday meal at your local food shelf. Get ideas for a "green" holiday.